On Saturday I made a trip up to Lake Crescent, Port Angles in the Olympic National Park with friends Peo and Steve C. The objective was to make a dive on the famous Warren car wreck. Just a handful of divers have had the chance to make this dive so it was an exciting opportunity.The story behind the wreck is filled with traumatic outcomes and mystery: July 1929 Russell Warren left his 12 and 14yr old sons with $35, paid off a $100 grocery tab, picked up a new washing machine and then left to go pick up his wife, Blanch, from the hospital. On their return they simply vanished; leaving two sons and a community wondering what had happened to them. Over the years the boys heard rumors that their parents had run off; Blanch’s father had also disappeared years earlier, never to be heard from again. So there was a certain mystique surrounding this family. In 1929, $35 seems like an awful lot to leave with the kids. Why pay off the grocery tab that same day? Was it simply a matter of money on hand or was it a man tying up loose ends? But if it was planned; why buy the washing machine? The two boys lived their life always wondering what happened, and they never found out – both boys died as men in unrelated events before the car was located or the mystery solved. The car, along with some remains, was finally found in 2001 with the use of side scan sonar and volunteer technical divers. 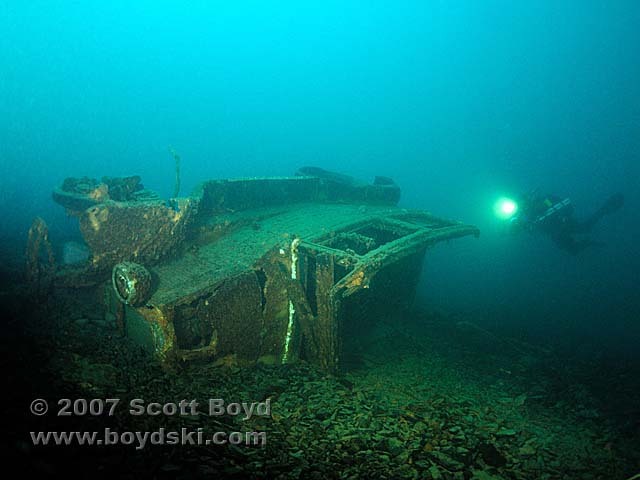 Once we were armed with the general location, Peo, Steve and I had heard that we would be able to see the wreck once we approached a depth of 170ft; this made us incorrectly assume we would find the wreck closer to 180ft deep. As such we traveled with 18/45 (oxygen/helium) as back gas. The slope was incredibly steep; an angle that matched the water temperature: 45degrees. The water was a perfect blue/green color that reminded me of the tropics; same with the visibility which approached 80feet. So we dropped down to a depth of 180ft and began following the contour line towards the direction of where we were supposed to find the wreck. 12 minutes of swimming at that depth later, we finally could see the wreck’s shadow some 60ft in front of us. We found it at a depth shallower than we had been traveling, in 166ft of water. It is lying on its side on the steep slope; and to me it looks like it has rolled down to this position over the years; there is lots of loose rock and shale in the area – and it has the wreck partially buried. I tentatively reached out and touched the frame of the car, partially expecting to ‘feel’ something ghostly. I didn’t, but something more than respect kept me from touching the wreck again. Among the myriad of rocks and boulders in the area, I noticed a large stone in close proximity to the Chevy that had a clean hole drilled into it like those you would expect to see in rock that had been drilled for dynamite. My personal theory is that the wreck was at one time in a shallower position but as they blasted rock to improve and widen highway 101 they inadvertently pushed the wreck to its current depth and partially buried it at the same time. There are even rocks in a the wheel well that is closest and parallel to the surface; a condition I would expect to happen only if the rocks came from above or if the wheel well scooped them up as it rolled down the hill. After a short survey of the wreck and the surrounding area we hit our 20minute bottom time; the limit we had set for ourselves in pre-dive planning. So we began our slow ascent and decompression back to the surface. By the 60minute mark we were back on the surface, breathing natural air and talking about the dive – mainly kicking ourselves for not bringing photo or video equipment. As such… we’ll be back.